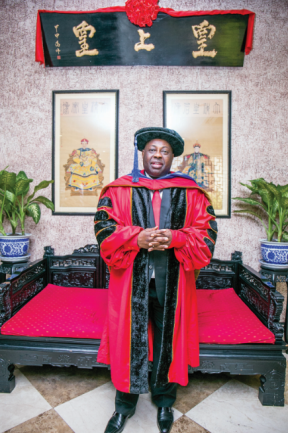 There was an overwhelming ovation for Ovation Publisher and Chief Executive Officer of Ovation Media Group, Bashorun Dele Momodu when he received a Honorary Doctorate Degree (Honoris Causa) from the University of Professional Studies Accra (UPSA). The event, which was graced by His Excellency, President John Dramani Mahama of Ghana, took place at the university’s campus in Accra. The award of Momodu’s Honorary Doctorate degree also marked the commemoration of the institution’s 8th Congregation Ceremony and it was historic because he would be the first non-Ghanaian to so honoured. The university management said it selected Bashorun Momodu in recognition of his outstanding contributions to the world of business, politics, literature and the media industry as well as his dogged commitment towards projecting the best of Africa to the world. Delivering a speech after he was decorated by the University’s Pro-Chancellor, HRM Drolor Bosso Adamtey I, Bashorun Momodu who was the sole honoree for 2016, thanked the University’s Vice-Chancellor, Prof. Joshua Alabi and the Governing Council of UPSA for singling him out for such a great honour. He recalled with nostalgia, his first contact with Ghana exactly twenty-one years ago when he fled Nigeria under the brutal dictatorship of the late General Sani Abacha for exile in the United Kingdom. “It was exile that miraculously gave birth to Ovation International magazine… Our Board decided on a few pertinent projections. We will promote Africa and debunk the malevolent prejudices against our continent. We will celebrate the beauty of Africa and encourage social and business interactions amongst our people. We shall produce a world class magazine that would be the pride of Africans at home and abroad. We decided to concentrate all attention on West Africa before spreading out to other regions. Nigeria and Ghana became our priority countries. “Before my first and forced trip to Ghana, I had encountered the old Gold Coast on the pages of literary works by The Osagyefo, Dr Kwame Nkrumah, Kofi Awoonor, Ayi Kwei Armah and company. I was particularly enthralled by the seminal work of Nkrumah and the thesis propounded in his book Africa Must Unite. Nkrumah introduced me and got me addicted to pan-Africanism though I had read pan-Africanist and Negritude works by Walter Rodney, Frantz Fanon, Chinweizu, Amilcar Cabral, Nwalimu Dr. Julius Nyerere, Leopold Sedar Senghor and others. I was exceptionally touched by Dr Nkrumah’s vision and was particularly convinced that Africa would never make appreciable progress unless Africans can join hands and lift themselves up. “It was with great delight that I received a refreshing letter from the University of Professional Studies Accra (UPSA) announcing the award of a Doctorate Degree (honoris causa) to be bestowed on me at the 8th Congregation ceremony of this prestigious institution today. I am truly honoured and full of gratitude to the Vice-Chancellor, Professor Joshua Alabi and members of the Governing Council of the institution for such a wonderful gesture”. He also used the opportunity to praise Ghana President, H.E. John Dramani Mahama for “ The rare leadership he has provided as President as he continues to illuminate the path of many, touching lives, breaking borders, setting new records and charting the course of a new brand of development that is not only exceptional but also visible and tangible. Sir, permit me to say that your calmness, simplicity, humility, passion and devotion to public service continue to demonstrate the stuff that truly great leaders are made of. History will be kind to you”. The University of Professional Studies (formerly known as Institute of Professional Studies) was founded in 1965 as a private professional business education tuition provider. The university was the first and is still the only public institution with the mandate to offer both academic degrees and provide training for higher professional education in Ghana.